Dispirited by low English proficiency rankings, the government is now bent on improving standards and has turned to international advisers for help. Dilnoza Akramova is reading out words in English to her third-grade class and the children repeat after her. The theme of the language lesson is vegetables and fruit. When she reaches “grapefruit,” the pupils are puzzled. They have never heard of this fruit. All Akramova has by way of a visual aid is a little picture in her textbook. Kids at the back in the class of 40 can’t make it out. This scene played out in a village in Uzbekistan’s Qashqadaryo region, but the same could have happened in most of the country’s schools. Paucity of teaching resources is the norm. The results are plain to see. Every year, Switzerland-based Education First compiles a report ranking countries by English proficiency. Of the 88 countries listed in the 2018 edition, Uzbekistan came in 86th. Dispirited by such findings, the government is now bent on improving standards and has turned to international advisers for help. Dilia Hasanova, a linguistician with two decades experience studying the state of English-language teaching in Uzbekistan, identifies several other factors beyond the lack of resources. These include poor teacher training, dismal salaries, weak command of English among newly minted English teachers, heavy teaching loads and the burden of bureaucracy. “Local trainers are not adequately trained to train local teachers. At least, I haven’t seen any evidence that would prove me wrong. When I talk to English teachers, they like using buzzwords like ‘I try to use communicative teaching methods in my classes,’ but when asked how they would define this method, they just say, ‘Oh we do lots of speaking in class,’” Hasanova said. The curriculum currently envisions two English classes per week from grades one to four. Through to grade 11 the number of lessons increases to three times weekly. “With two-to-three lessons weekly, if any of the students is able to master even an elementary understanding, this makes me happy,” Akramova said. But those with means splash out on extra classes. “As a rule, enthusiastic parents ask me to do private classes, so I am often working as a tutor,” said Akramova, whose $200 monthly salary is higher than that of colleagues teaching other subjects. Now, Uzbekistan’s Education Ministry and the British Council, a charity backed by the UK Foreign and Commonwealth Office, have teamed up to try overhaul the way English is taught. Akramova’s most recent advanced training course was in 2011. And yet she has never sat an IELTS test – a widely recognized standardized test of English proficiency. The government’s plan is for teachers to be eligible for additional training up to twice a year starting in March. Perdeshov would like to see more native English speakers coming into Uzbekistan’s schools and universities, possibly along the lines of the U.S.-funded Peace Corps. Many sorely miss the Peace Corps, whose volunteers fanned out into schools and universities, among other places, following a 1991 agreement between the governments of the United States and Uzbekistan. “When I studied at the Institute of Foreign Languages in Tashkent, we had volunteers from the Peace Corps. Volunteers participated in the training of students. It was good practice for the students, because they could hear native speakers of English,” Abdulla Tajibayev, an English translator, told Eurasianet. The Peace Corps mission was, however, one of a large number of foreign-funded initiatives to get the chop in 2005 following a cataclysmic plunge in relations between Tashkent and Western governments following the bloody suppression of an anti-government demonstration in Andijan that year. The restoration of warm ties between Uzbekistan and the U.S. leaves the road open to movement on that front. When Uzbek President Shavkat Mirziyoyev visited Washington in May 2018 to meet with President Donald Trump, he received assurances that Washington would assist with English-language training programs in Uzbekistan. Mirziyoyev said that the U.S. would even help set up schools with all-English instruction. Any such initiatives would concern only an elite and select number of schools, however. 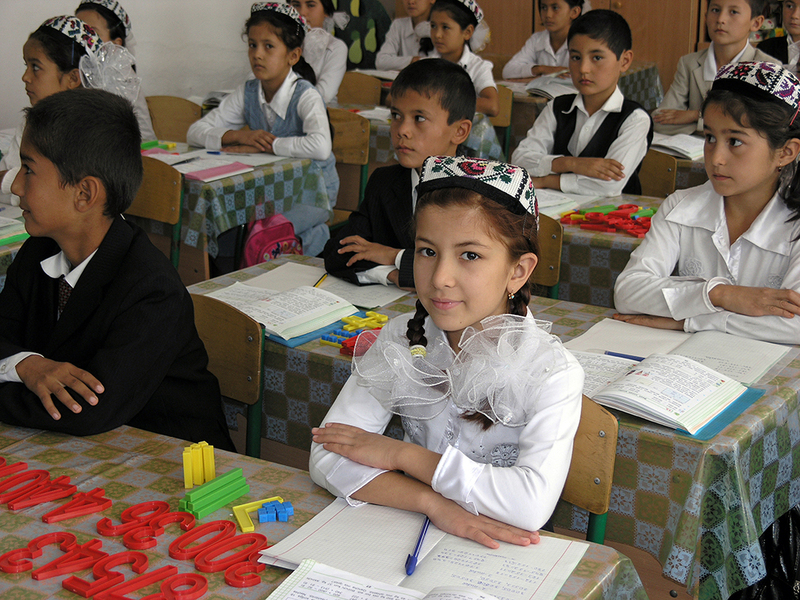 As Anvar Umarov, a representative of the Education Ministry, told Eurasianet, there are currently 9,691 secondary schools catering to a total of 5.8 million pupils in Uzbekistan. For any improvement to be felt, they will need be to be broad as well as deep.